December is key in the NFL, and that means that big players need to step up and make big plays. That was very much the case yesterday, with some of the top defensive players really standing out with big time performances. So with that in mind, here are the Sunday Standouts on the defensive side of the ball this week. 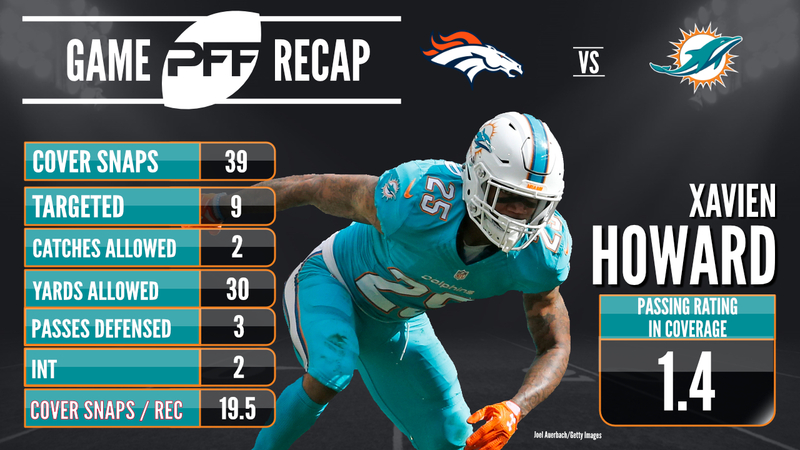 Delivering one of the top performances of the season by a defensive player, Miami Dolphins cornerback Xavien Howard did it all on Sunday. Targeted nine times in coverage, he allowed just two receptions for 30 yards, breaking up three passes and picking off two more, including one which he returned for a score. All that added up to an NFL passer rating allowed of just 1.4. This marks the second consecutive week where New England Patriots cornerback Stephon Gilmore has made this list, after another big performance in a Patriots win. Gilmore saw six passes thrown into his coverage and allowed just two receptions for 22 yards, finishing the game having allowed an NFL passer rating of 45.1 on throw into his coverage. While he wasn’t quite as dominant as his Dolphins teammate, Bobby McCain had a very good game too. Allowing just one reception for six yards from 39 snaps in coverage, he finished the game allowing an average of 0.15 yards per coverage snap, which is currently third best in the NFL this week. Unblockable. That’s really the only way to describe Oakland Raiders edge defender Khalil Mack after another dominant performance on Sunday against the New York Giants. 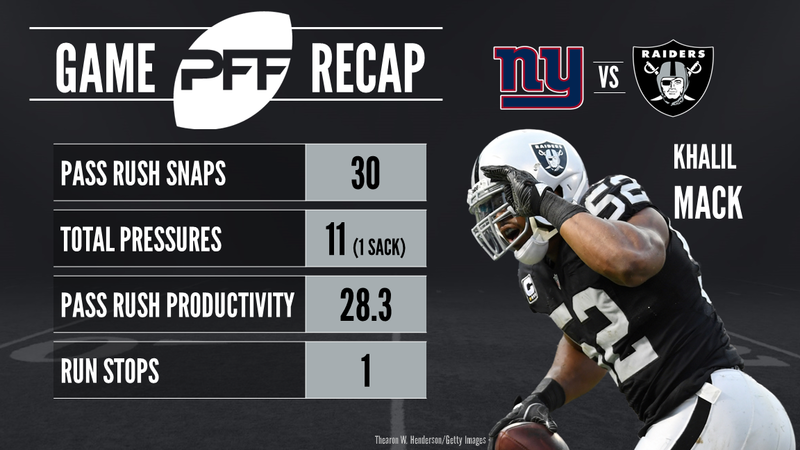 Mack rushed the passer 30 times in the game, and produced a pass-rushing productivity rating of 28.3, with a sack, a hit and nine hurries. The cherry on the cake was that the sack was actually a trifecta, with Mack sacking quarterback Geno Smith, and ripping the ball away from him for the takeaway. After inexplicably missing the list last week, Los Angeles Rams star Aaron Donald was back where he belongs this week with another big performance. Dominant as a pass-rusher, Donald racked up two sacks and seven hurries from 36 pass-rushing snaps, good for a 20.1 pass-rushing productivity rating. A big day in coverage for Jacksonville Jaguars safety Tashaun Gipson sees him make the list this week. He saw three passes where he was the defender in primary coverage, but didn’t allow a single reception, and had an interception too. Not surprisingly, his NFL passer rating allowed in the game came in at 0.0. An active day in coverage saw Los Angeles Charles safety Jahleel Addae targeted six times, but he allowed just two receptions for 15 yards, and had a pass breakup to go along with it. Cleveland Browns rookie tight end David Njoku had an impressive game, but picked up just one reception for seven yards on throws into Addae’s coverage. You just can’t run the ball on New York Giants interior defender Damon Harrison, and this week was just more proof of that. With four tackles resulting in a defensive stop on 23 snaps against the run, Harrison produced a 17.4 run stop percentage which is currently the third best mark on the defensive interior this week. He did allow a touchdown in coverage, but Jalen Ramsey was outstanding outside of that play, allowing just three receptions for 58 yards from 45 snaps in coverage and coming away with another key interception. Ramsey is a serious contender for defensive player of the year, and if he keeps making plays like that, it won’t be a shock to see him claim some hardware. Continuing a season where he deserves defensive player of the year consideration, Minnesota Vikings safety Harrison Smith stood out against the run. From 21 snaps in run defense, he registered two tackles resulting in a defensive stop, good for a 9.5 run stop percentage.